Since introducing ViviStone architectural glass in 2011 with the launch of Honey Onyx, we’ve added Abalone Onyx, Cream Onyx, Pearl Onyx and Opal Onyx to the line. While these five stone families offer a wide variety of colors and design options, there was still one request that we received consistently from our customers: a stone that is predominantly white in color to complement clean, modern spaces. 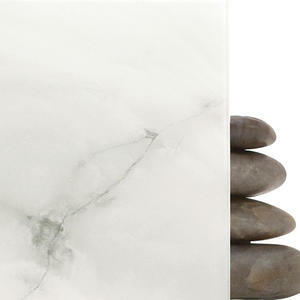 After many months of development to find just the right stone, we are delighted to introduce ViviStone White Onyx. ViviStone White Onyx unites the beauty of stone with the convenience of architectural glass. Nearly indistinguishable from real stone, White Onyx offers a modern take on a classic neutral aesthetic. Subtle shifts of white and grey, accented by charcoal veining, give this stone character and dimension without being overpowering. White Onyx is available in four unique slabs in dimensions of 48"x 102" and has been added to our Virtual Quarry, our interactive tool that makes it easy to configure your ViviStone glass designs. We’ve also added it to the Surfaces Library in our innovative new Elevator Design Studio, which lets you choose an elevator interior configuration, apply materials and finishes from our extensive Surfaces palette, view your progress in realistic renderings, and request budget pricing—all with a few simple clicks. As with our other ViviStone products, White Onyx can be used in many F+S products, including Elevator Interiors, LEVELe Wall Cladding, LightPlane Panels, as well as in room dividers, railing infill, partitions, backlit configurations and custom projects. ViviStone is suitable for interior and exterior applications. Take a look at ViviStone White Onyx and imagine the many ways you can use this innovative material to enhance a wide range of settings. For more information on White Onyx, visit the product page on our website, or contact us.